The One Direction singer - who already has five other etchings - had a black image of the musical equipment inked onto his right forearm and he seemed very pleased as he posted a picture on twitter. However, his bandmates - Louis Tomlinson, Harry Styles, Liam Payne and Niall Horan - weren't so impressed and ridiculed him during their performance at the Gibson Amphitheatre in Los Angeles over the weekend. 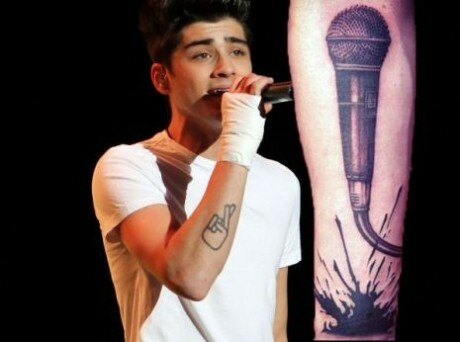 Halfway through the show the four boys all decided to put their real microphones on their forearms to poke fun at Zayn's real tattoo. In April, Zayn, 19, had a symbol tattooed etched onto his left collarbone and told his twitter followers the meaning behind the words. He tweeted: "For every1 asking what the new tatt means it says be true to who you are. (sic)"
He also has his grandfather's name on his chest in Arabic and a silver fern, which is the national symbol of New Zealand.